I plummet into the warm ocean, splash and gasp for air, salt water filling my nose, splashing some more. When I make it back to surface, I try desperately to blow the water out of my nose and rub the salt out of my eyes. “You ready?” the jet ski pilot shouts and I shake my head. Wait, a moment, I need a moment to get myself back together! And then it’s on again. 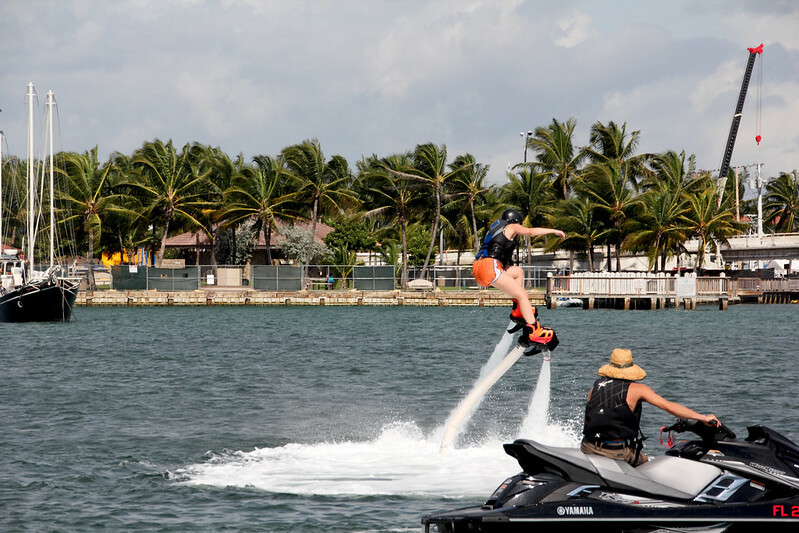 Flyboarding is not the easisest sport, but all worth the practice. “Always keep your legs straight” is the rule. “Keep your hips forward” is another one. You can see how well this is going. Good thing the Atlantic’s warm in South Florida. This is an activity you want to reserve for warm waters. There are several different types of flyboards, and the one I tried out was one of the easier ones. Harder boards have more buoyancy which means it’s “easier” to do flips and turns, but the board I tried was more stable and easier to stand on, which is perfect for a total beginner. That still didn’t make it easy. I’ve always thought I have fairly strong legs, but it was still hard standing when the board was forcefully pushing me up to the sky. 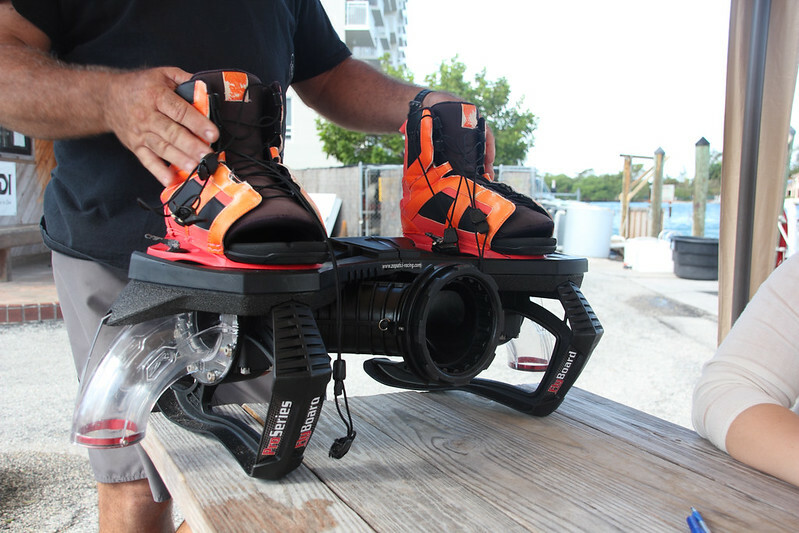 The more stable flyboard that South Florida Flyboarding tied me to so I could reach the skies. This is me sitting in a plastic chair, getting my shoelaces tied. The jet ski pilot handled the force of water flowing from the board, which was great: one less thing for me to think about. I had enough on my plate trying to balance and keep the board horizontal. The only way I could rise up on top of the board was aiming the flow of water straight down, and a smallest movement to any direction plummeted me back in the sea. 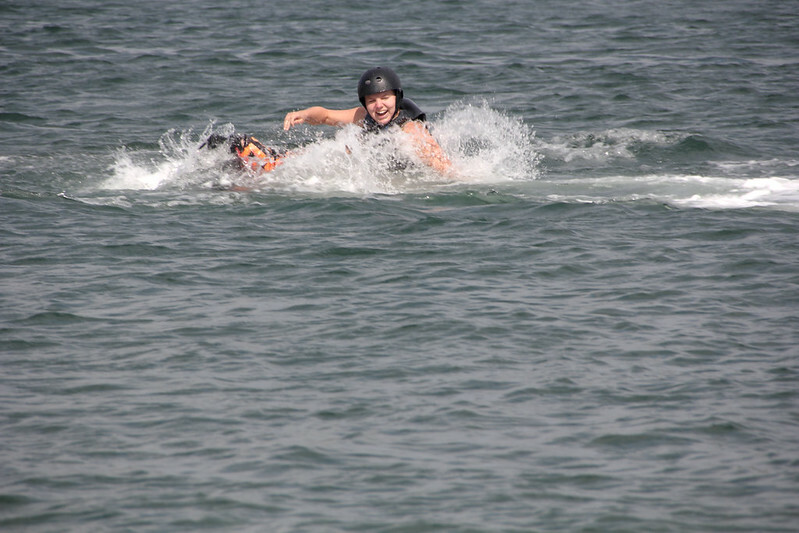 Good thing water is my favorite element, because there was little time to prepare for being whisked under the waves. After five minutes, the thought of giving up passed through my mind – but only passed. In ten minutes I was already flying up in the air for minutes at a time. I’d found my balance, and I have no clue how. It just happened! The training session lasted for 15 minutes, after which I retreated back to dry land to breathe and relax, and to follow others’ attempts at flying. Later in the day, I got another chance at flyboarding, and finally I felt like I was “soaring like a bird”, like they had promised I would. Dolphin jumps I gladly left for another time. 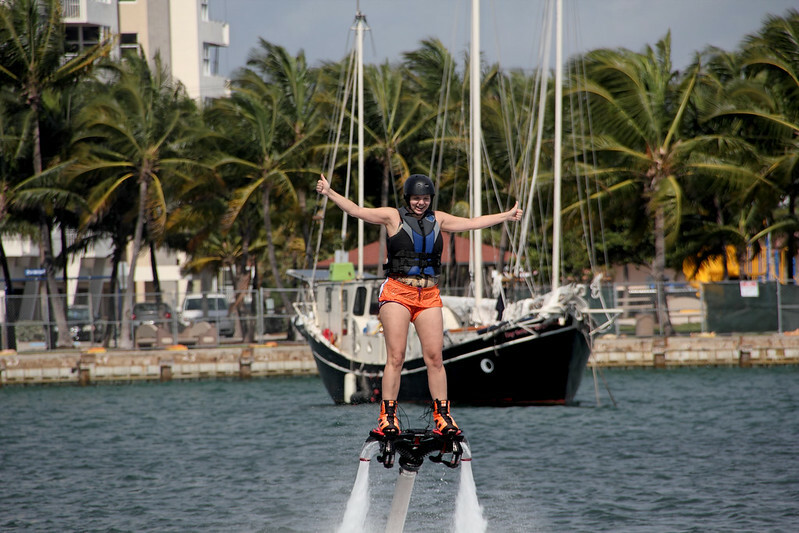 Flyboarding was part of a press trip arranged by Greater Fort Lauderdalen. 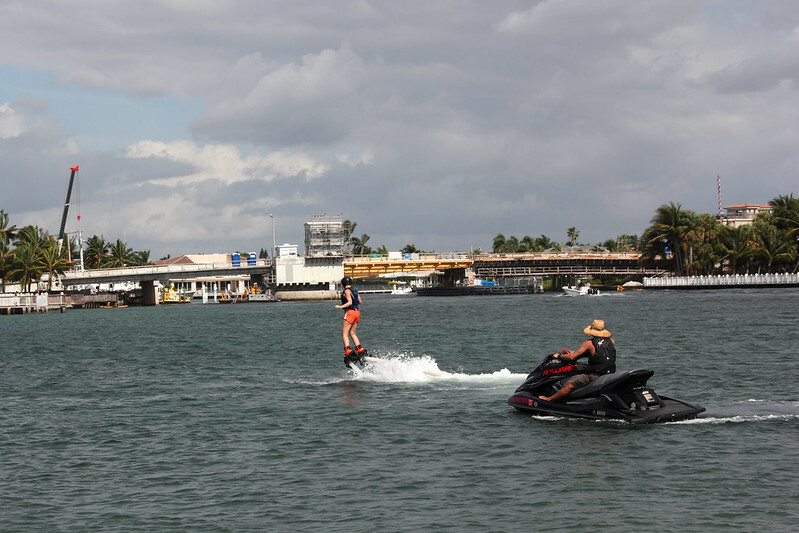 I thank South Florida Flyboarding for giving me the opportunity to try out this great sport. 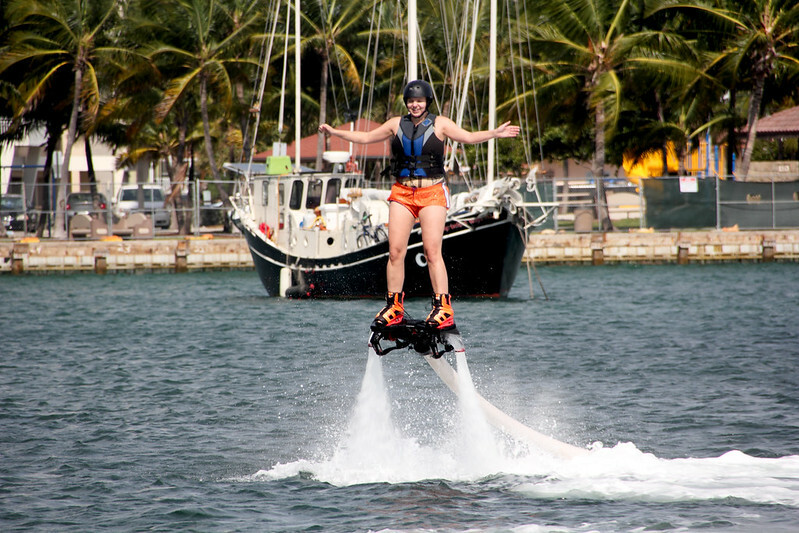 If you’re interested, check them out for your own flyboarding experience. 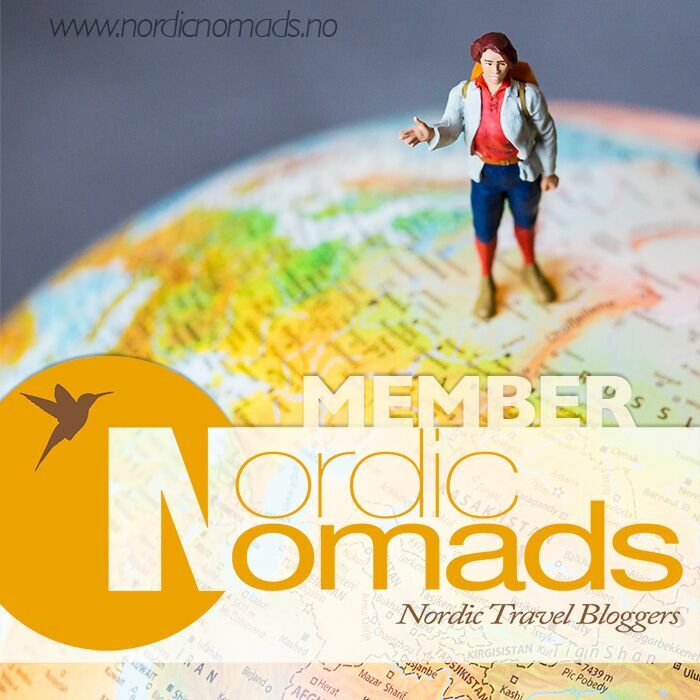 Previous PostBest 7 Beaches in the WorldNext PostNational Parks Calendar for 2016 – order now! i try this flyboarding once! and the funny part is i felt like ive been in a car crash without a car!! hOur company offers supreme quality pharmacy. Look at our health contributing website in case you want to improve your health. Our company provides a wide variety of non prescription products. Visit our health site in case you want to to improve your health with a help generic supplements. Our company offers safe pills. Take a look at our health contributing portal in case you want to feel better. Our company provides a wide variety of non prescription products. Look at our health site in case you want to to improve your health with a help of general health products. Our company provides a wide variety of non prescription products. Take a look at our health portal in case you want to look healthier with a help generic supplements. Our company provides safe healthcare products. 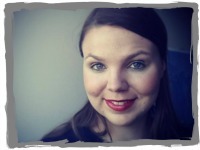 Look at our health contributing website in case you want to look better. Our company provides a wide variety of non prescription drugs. Look at our health website in case you want to strengthen your health with a help generic supplements. Our company provides a wide variety of non prescription products. Take a look at our health portal in case you want to to feel healthier with a help of health products. Our company offers a wide variety of non prescription drugs. Take a look at our health portal in case you want to look better with a help of health products. Our site offers a wide variety of non prescription drugs. Look at our health website in case you want to strengthen your health with a help generic supplements. Our company provides a wide variety of non prescription drugs. Visit our health site in case you want to look healthier with a help general health products.